Land snap by UMNO, Ministry no answers! There was another exchange today when DAP MP for Cheras, Tan Kok Wai raise the question of land snap by UMNO Cheras Division to build their division headquarters in an open space which belongs to the government without obtaining any approval from Kuala Lumpur City Hall (DBKL). Kok Wai was very furious as the deputy minister replied on behalf of his ministry, the MP from Masjid Tanah refuse to answer as he claimed that the matter is not under the portfolio of his ministry. Do you believe what he say when matters pertaining to DBKL are directly under his portfolio and such blatant land snap by UMNO and erection of illegal structures are directly under the jurisdiction of DBKL? Stop the rot! Stop the patronage! Deputy Speaker of Malaysia Dewan Rakyat, Lim Si Cheng, today kept disturbing YB Teresa Kok (DAP - Seputeh) speeches when she took part in the committee debate of Ministry of Federal Territories. There was even one tine when Teresa shouted unfair to Si Cheng that she should be allowed to deliver her debate speech without any interferences from the Deputy Speaker. She was almost chasen away from the House. The Prime Minister, Datuk Seri Abdullah Ahmad Badawi returned from the Kampala Commonwealth Heads of Government Meeting (CHOGM) and threatened to use the nefarious law, the Internal Security Act (ISA), against peaceful demonstrators – marking a new nadir of the four-year broken pledges by the Abdullah premiership on democracy, human rights, accountability, incorruptibility and preparedness to hear the truth from the people. MCA Deputy President and Transport Minister, Datuk Chan Kong Choy has confirmed that he is a Minister-on-the-run from his sheer inability to answer five simplified questions on the RM4.6 billion Port Klang Free Zone scandal in Parliament yesterday. For more details please follow this. The social, cultural and political uneasiness of the Indian Community has suddenly become the main topic of discussion and debate in this country after the mammoth rally which took place on Sunday 25thNovember07 in Kuala Lumpur. The MIC President and Works Minister has refuted in uncertain terms that MIC has been a let down to the Indian community. Barisan Ministers and MP's are also echoing the sentiments of Samy. But these assertions if true the more then 30,000 people would not have got down to the street to air their grievances. 1) The Indian community only controls 1.2% of the equity as compared to over 20% by the Malays and nearly over 40% by the Chinese. Out of the 1.2% of the Indian equity one person AnandaKrishana one of the richest man in the country of Indian origin possess nearly 1% of the stake. This leaves the nearly over 2 million Indians owning less then a mere 0.2 of the equity of the country. Now this is the where the so call equal distribution of the economic cake has not benefited the average Malaysian but a few businessman who have are well connected with political leaders of the country. 2) Social problems of the Indian community have been consistently overlooked and side stepped. Take for example a) Suicidal rates. The Indians have the highest suicide rate (21.1 for every 100,000 as compared with the Chinese (8.6) and Malays (2.6) The high rate of suicide clearly shows that the community members are not able to handle the daily demands of life and find a easy way out to commit suicide. B) High numbers of Indians involved in criminal cases as can be seen with over 40% of detainees at the Simpang Renggan detention. Frequently Indians who have been out of the estates land up in urban areas without proper housing and lend up as squatters. Here they find difficulty in getting jobs although the country claims full employment! The failure of the Government to quickly to assist this needy people. 3) The rampant demolishment of Hindu temples all over the country is another cry of the community. Many of the temples are sitting on private or government land .Over 500 temples have been demolished over the last few years with little respect to the sensitive of the Indian community. Hindu goddess statue have been broken with little understanding of how the Hindus feel. Although many a time this matter has been raised in parliament and even brought to YB Nazri in 2005 who said will look into the greivences but to date nothing has taken place. What is needed is a real new policy decision on Temples to be adopoted by the government. 4) Tamil Schools are in a deplorable state and there is also a shortage of teachers. Samy has said over 180 tamil schools have been built over the last two decade and another 80 new Tamil schools would be build. We doubt the figures given by Samy. Under the 9thMalasyisa plan No NEW Tamil schools would be build. That means for the nest 4 years without new schools is Samy saying the new 80 schools would be build in the 10th Malasia plan! 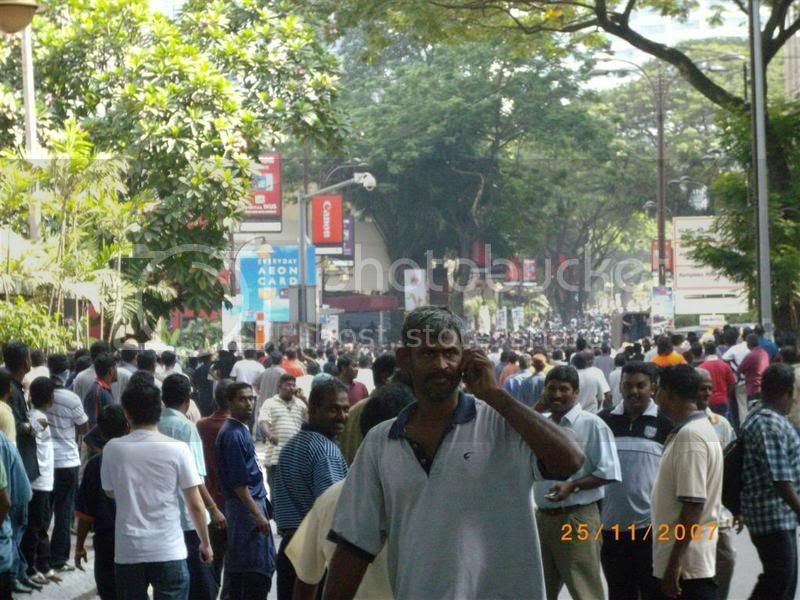 In July 2006 over 500 Indian parents protested on the shortage of over 500 teachers in Perak. Although this matters have been raised many a time in Parliament little has been done to address this issue. Why? Is it because the Indians are insignifant as a voting block in this country? We feel the time has come for the Government to get to the bottom of the matter and find ways to address the matters of public importance. One way for immediate way to attend to all these is to set up a revolving fund of 1 billion to be administered by a special agency of the government to up lift the economic well being of the Indian community. An annual grant of 1 billion for this agency must be done until the community is at par with the other communities. The people in power must all stop the denial syndrome. Kit Siang and Ahmad Shabery Cheek exchanged words on Hindraf gathering last Sunday. Ahmad Shabery Cheek is the Parliament Secretary for Ministry of Foreign Affairs. 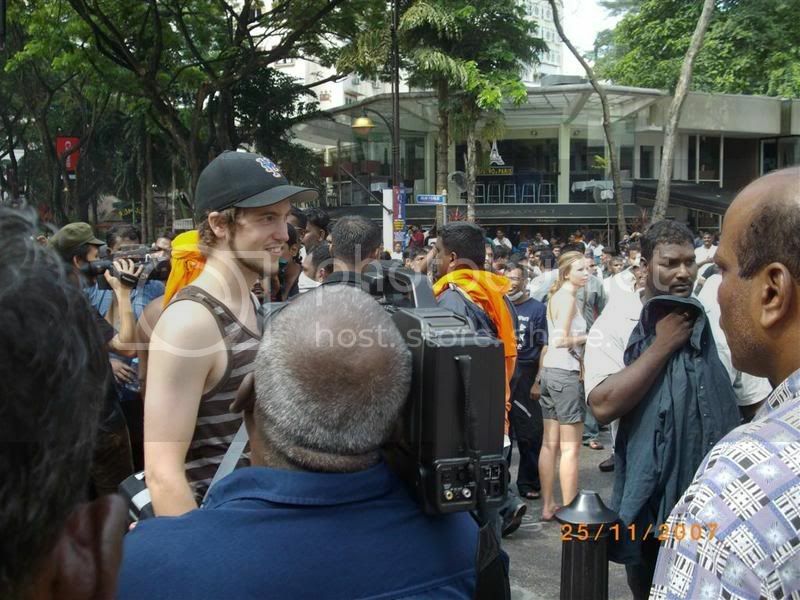 Kit asked him question on whether Wisma Putra (Malaysia Foreign Ministry) received any official complaint from Hindu organisations / Indian government regarding the high-handed manner of the police in handling the crowd. Forty-five people will be charged at the Selayang Sessions Court today with allegedly taking part in an illegal gathering at the Batu Caves temple early Saturday morning. The charge is being brought under Section 27 of the Police Act which stipulates the need for a police permit to gather in a public place. They were part of a larger crowd that had gathered at the temple in the early hours of last Sunday, with the intention of participating in the Hindraf-organised rally later that morning at Jalan Ampang. About 1,000 people who had gathered at the temple were forcibly dispersed by the Federal Reserve Unit using tear gas and water cannons. Security is very tight at the Selayang Sessions Court with seven FRU trucks and about 30 police personnel on standby. The Kuala Lumpur and Selangor Bar has sent lawyers to assist the 45. Another 55 protesters will face the same charge at the Kuala Lumpur Magistrate's Court for taking part in the Hindraf rally on Sunday. Under Section 27(5) of the Police Act, anyone taking part in an illegal gathering is liable, upon conviction, to a fine of RM2,000-10,000 or imprisonment of not more than a year. Kit Siang and Chong Eng were there giving morel support to the Indians at Selayang Court this morning. Sepak-menyepak, tendang-menendang di DUN Kelantan. ADUN UMNO Nozula menendang ADUN PAS. Youtube ini cukup mengecewakan kita semua, tetapi ianya cukup benar dalam mendedahkan wajah sebenar kelakuan BN dan kuncu-kuncunya di Parlimen dan DUN. Dulu bila di Selangor, Raja Klang yang bilik rumahnya lebih besar daripada rumah kos rendah rakyat termiskin, Zakaria Md Deros, pernah sekali menampah ADUN DAP Teng Chang Khim. Mereka pernah mengeluarkan perkataan "bocor", "monyet", menghalau orang Cina keluar dari Malaysia, "mari lawan" dan sebagainya. Sekarang pula di Kelantan dan lebih dahsyat lagi, kali ini berlaku di dalam Dewan. Bila pula budaya parlimen ala samseng Taiwan dan Korea Selatan meresap ke dalam Malaysia? Ataupun kelakuan sebegini lebih mirip kepada Mat Rempit? Bagi mereka yang tidak permah melihat keganasan wakil rakyat BN, biarkan kita melihat klip ini. Adakah anda masih percaya wakil rakyat BN yang dipilih anda benar-benar melakukan sesuatu kepada rakyat di Parlimen atau DUN, ataupun mereka lebih berminat untuk "mari lawan" dengan pembangkang dan menjadi kaki lawan? Anda lihatlah dengan mata sendiri. Indians are third class citizens? The wholly unnecessary and excessive use of force by police in firing of tear gas and water cannons against poor Tamils and ordinary Malaysians gathering to voice their grievances is simply intolerable and totally unacceptable in a democratic society respecting the human rights of its citizen. Over 450 were arrested and dozens suffered serious injuries. The use of such excessive force is evidence of the discrimination against Tamils and other fellow Malaysians, the state have shown consistently in recent years. It is yet another example of a high-handed, ham-fisted and undemocratic tactics used against poor citizens who are peacefully assembly to air their grievances. The serious violation of human rights and the high handed manner of police and government action calls for a serious debate in this august house.It is a pressing issue because the Indian community of two million people are upset and angered. They ask whether they are equal first class citizens or unequal third class citizens who deserves such wanton treatment. Peaceful demonstrations and marches are common and accepted practices around the world. It is a natural form of showing displeasure. Only backward uncivilized societies will use force against its own citizen. After today Malaysia is simply a police state in the eyes of the world and its own citizens. Hindraf (Hindu Rights Action Force) have filed a class action suit against the British government in London for taking Indians to Malaya as indentured laborers and exploiting them for 150 years and there after failing to protect their rights as minorities under Malaysian constitution and law. The Malaysian government should take the above suit seriously and if it does not agree to it challenge it. Bullying tactics by the government and its agencies against Indians and minorities must stopped. they must be held accountable for their actions. The police and Government should be blamed for arresting without justification hundreds of people. Many suffer serious injuries. All this could have been avoided if the police had allowed a peaceful assembly to voice legitimate grievances. The Speaker said in order to allow a full debate of the motion according to the Standing Orders of the Dewan Rakyat 3 pre conditions need to adhered to. That 1) the motion is specific – Speaker agrees 2) that the motion is of public importance –he too agrees with this but my motion failed on the issue of urgency. The Speakers mentioned that the police have not granted a permit for the demonstration and there was a court order which prohibited HINDRAF and its supporters from attending the demonstration. It is regretted that the Speaker rejected my motion for matters of public importance could have been discussed and a strong message could have been sent to the Police and the Government. The issue of lack of opportunities for Indians to join the civil service (in 1970 there were more then 10% now less the 5%, why? ), the failure to build a single new Tamil schools under the 9th Malaysia Plan, why there is a high rate of unemployment, suicide, single mother, criminal cases, illiteracy, the indiscriminate demolishment of Hindu Temples and why over 45% of the detainees at Simpang Renggang are Indians. A select Parliamentary committee to look into the woes of the Indian Community should be formed. A golden opportunity to air the communities grievances could have been discussed and debated but all these has now been “swept” under the carpet and hibernating! A Barisan Nasional MP departed from the norm today when he said the rally organised by the Hindu Rights Action Force (Hindraf) reflected the Indian community's disgruntlement towards certain government policies. YB K.Devamany (MIC-Cameron Highlands) added that the rally proved the failure of government policies which do not benefit the Indians. The ruling politician made the remark after interjecting Parliamentary Opposition Leader YB Lim Kit Siang (DAP-Ipoh Timor) who argued that the rally was 'a cry of desperation' from the Indians. "Some 50,000 people took to the streets yesterday. It shows the government's failure and it needs to be looked into carefully," said Devamany. Meanwhile, Lim stood up and told Devamany not to be a hypocrite by practising double standards. He was referring to Devamany's interview with satellite station Al-Jazeera yesterday, in which he condemned the rally. "Devamany should publicly apologise for his Al-Jazeera interview yesterday belittling the Hindraf demonstration and condemning the demonstrators when he should be deploring the police mishandling and excessive use of force in firing tear gas and liquid chemicals against the defenceless and unarmed in Kuala Lumpur yesterday", said Kit Siang in his statement today. Another shot of how an Indian was brought back. You can see at another shot that a foreigner, who is a woman in light blue shirt outside Nikko Hotel, accompany by her boyfriend (or relative/friend?) pleaded to the policeman to release an innocent Indian who was caught and attacked by police. You see, who is terrifying here? The Police? The demonstrators? Who is terrifying the tourists? From here you can see how police just catch any Indian on the street. 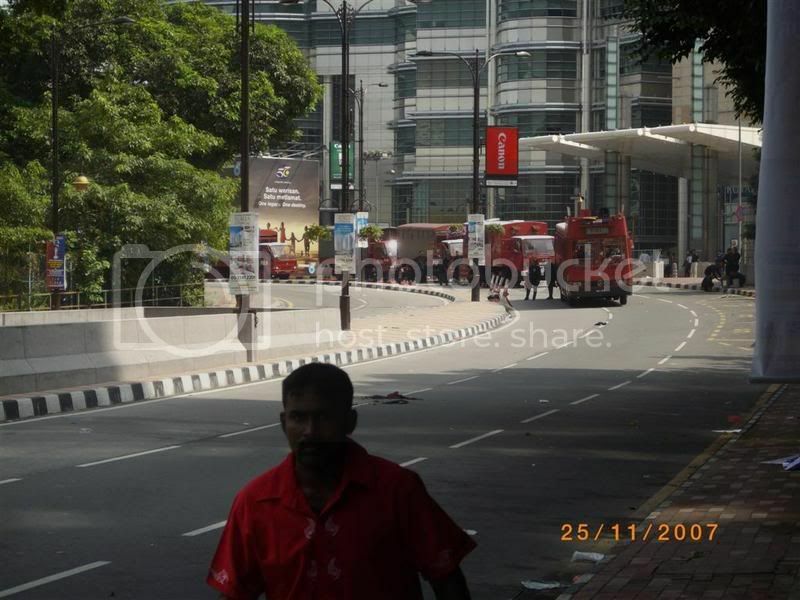 You can see one policeman dragged an hand-cuffed Indian across the street and another scene shows a group of policemen crashed into Citibank lobby and dragged an Indian out of no reason. I wonder if the police had said this to those arrested according to procedure, that the police must identify himself and informed the arrested why he was arrested and hand-cuffed. It will be a gross power abuse if the police acted in such a harsh manner. There was one scene here right at the junction close to Nikko Hotel when the FRU personnel did not check the wind direction before firing teargas until the teargas they fired blown back to them by the strong opposite wind direction, causing discomfort and uneasiness among the unmasked FRU personnel and policemen and policewomen hiding behind them. After reinforcing themselves and firing several teargases, FRU started to move in to disperse the crowds. Followed tightly behind the FRU are plainclothes and uniformed policemen and women. You can also see a FRU member holding a M-16 machine gun. Is he going to fire live bullets?? I have managed to hide inside them and had noticed that they are growingly impatient as they have been trying to chase away the crowd since early morning but to no avail. The commander shouted that the police can "catch at will", meaning they are allowed to catch and hit any Indian on the street, whether they are walking, eating or doing nothing on the street. Such harsh targetting invites criticism as it is a clear violation of human rights as the police even raided a nearby Mamak restaurant where some Indians are having their lunches inside. This scene shows how the FRU reinforce themselves and prepare to attack the crowd. 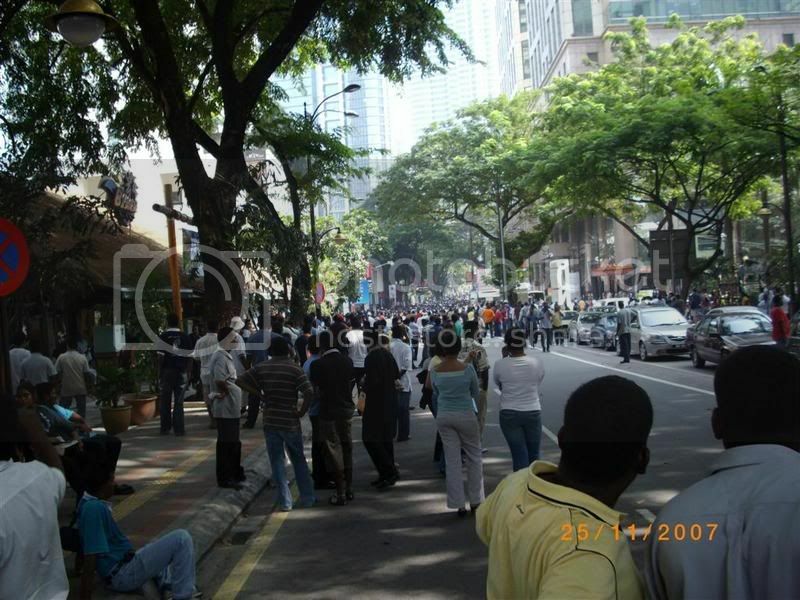 They marched and shouted loudly with the intention to terrify the gathering crowd along Jalan Ampang. 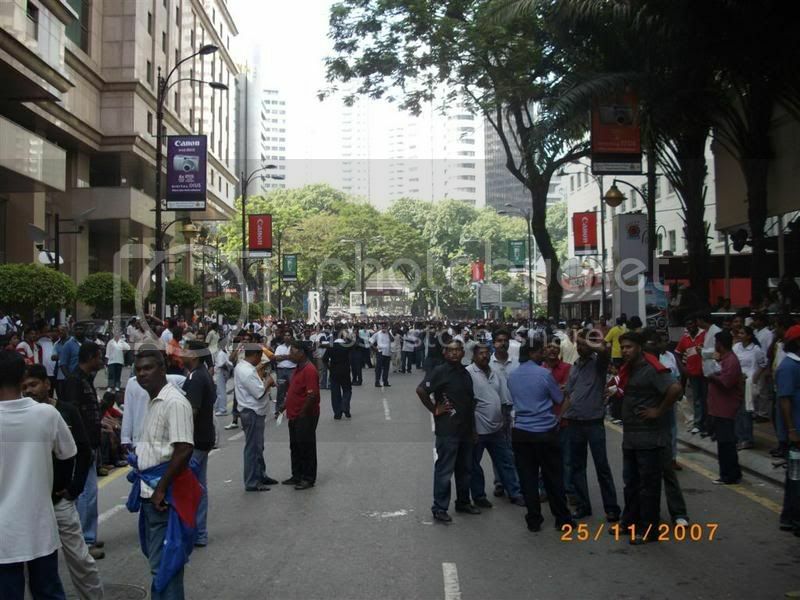 Members of Malaysia's Indian community have protested on the streets of Kuala Lumpur, the capital. They are demanding equal rights in a country they believe discriminates against them. They are also said to place blame on the colonial policies of Britain, and were intending to deliver a petition to the British High Commission in Malaysia. Al Jazeera's Hamish MacDonald was there. "Today the Malaysian Government lost votes from all Indians in Malaysia". This is what chanted form this gentleman in red T-shirt. Will Malaysian Indians come out and vote the opposition in the coming general election? They also said that they are prepared to go to jail to fight for their rights. Shouting match between the police and Hindraf members over the arrest of a Hindraf member. An Indian man was seen being taken away from the crowd. Some of his friends are following him. People are angry but they never acted violently against the police. 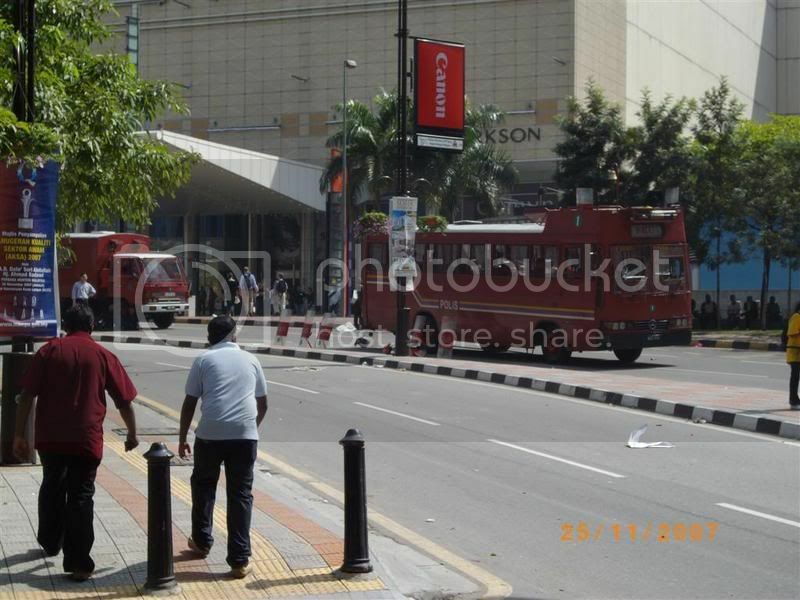 I was at the scene reporting from KLCC Suria. This man in red is Kumaran from Penang. He was arrested early in the morning while sitting at a bus stop. He claimed that he was unlawfully arrested as the office who arrested him did not tell him the reason why he was arrested. What is ridiculous here is that the police seemed to arrest any Indian on the street whether they are participating in the Hindraf protest or not. My argument is that even if they are going to participate, they should not simply arrest people without following proper procedure! This is a video showing some Indians talking and explaining to a foreigner, likely to be tourist. Actually there were some tourists around KLCC yesterday despite the high tension between the police and the demonstrators. Maybe to them, they are used to such demonstrations as it always happen in their coutries. I believe what is most shocking for them is the high-handed violence from the police against the demonstrators. Police started raiding a restaurant in Jalan Ampang. Police raided a Nasi Kandar restaurant located along Jalan Ampang at about 12:52pm. Policemen in uniform and plain clothes rushed in the restaurant when a the restaurant is full with Indians having their lunches to catch any Indian at sight. Such act raise question if the police can differenciate between demonstrators and restaurant customers. This is a blatant power abuse! Even if the demonstrators are having their meals inside the restaurant, and are not demontrating anything, the police have absolutely no right to catch anybody! I saw an Indian who was at the video standing next to me pushed and pointed by a plain cloth police wan was shouted at with vulgar word "Bodoh" (stupid). I quickly pushed him away and stood farside from a pavement watching a group of licensed samseng harrassing Indians eating out at a restaurant. A scene showing an Indian standing by the roadside arrested by the police. A plain cloth kicked him once. Another uniform policeman came and kicked him the second time. This happened in front of Wisma MCA Jalan Ampang at about 12:44pm. Tens of thousands of Malaysian Indians today gathered around KLCC to protest against unfair treatment by the UMNO-led BN Government. I attended the Hindraf rally this morning and this is the day I feel ashamed to be a Malaysian to see how cruel and violent Malaysian Police treating their masters. I will upload more videos and photos in YouTube. You can see some very violent act against some of our Indian friends. 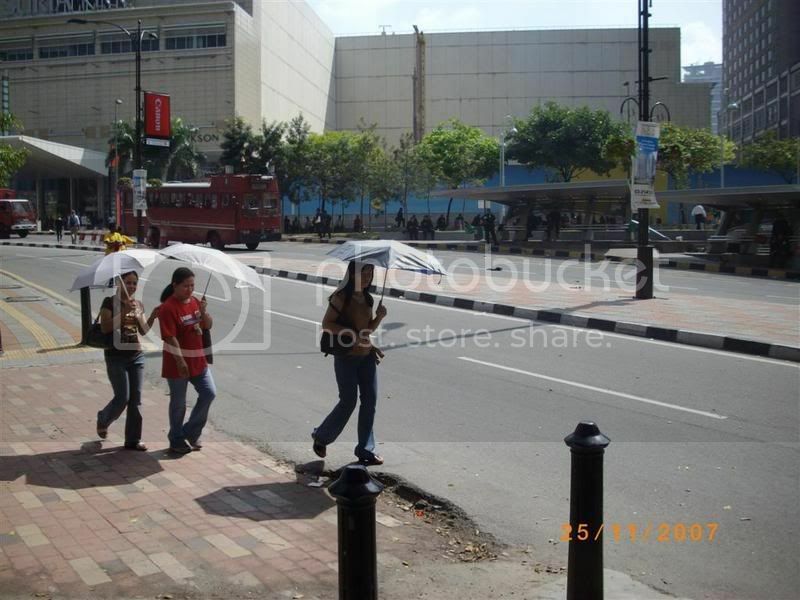 A Malay plain cloth pointed a finger at normal Indians walking on the street and shouted "bodoh". When the Indians rushed to a nearby Mamak restaurant to have their meals and drinks, the police rushed into the restaurant like samseng and dragged all the Indians out. Are they police or samseng? You will never be able to differentiate! Somebody must be answerable to all these violences from the men in blue. Hindraf, I'll present - When there’s a need, why selfish to lend a hand? I have the chance to read some comments and blog-posts on Hindraf’s rally tomorrow. While I have a lot of reservations with Uthayakumar’s character and his way of championing his struggle with the opposition, I will participate in the rally this Sunday, not because of Hindraf, not even because of Uthayakumar, but because of equality and Malaysian-ness, that we cannot afford to witness inequality, injustices and discrimination continue to happen in front of our own bare eyes. Some has disregards on this rally, saying that it is a communal rally for the Indians and the Hindus, especially the under-priviledged. And because of this, they will not participate in the rally. Some are saying that race-based rally or activity is not what they stand up for. I am using the same reason to explain why I will be present, that it is the responsibility of all peace-loving Malaysians who uphold justice and democracy to correct whatever wrongs in this country, including inequality in wealth distribution, which has resulted the Indian as an under-class in Malaysia. The Indians in Malaysia are in despair, anxiousness and desperate. When there’s a need, why selfish to lend a hand? I would like to share a youtube with you, “We are the world”. 1. Dato’ Markiman bin Kobiran [Hulu Langat] minta Menteri Pengajian Tinggi menyatakan justifikasi melaksanakan “International Organization for Standardization (ISO)terhadap tugasan akademik di Institusi Pengajian Tinggi Awam di negara ini. Timbalan Menteri Pengajian Tinggi [Datuk Ong Tee Keat]: Tuan Yang di-Pertua, untuk makluman Ahli Yang Berhormat, MS ISO 9000 sebenarnya adalah satu standard bertulis yang menetap dan menyenaraikan elemen-elemen asas yang perlu ada dalam sistem kualiti sesebuah organisasi bagi memastikan perkhidmatan yang diberikan dapat memenuhi kehendak pelanggan. Pelaksanaan Standard MS ISO 9000 dalam perkhidmatan awam bertujuan untuk memastikan semua agensi kerajaan termasuk badan berkanun seperti IPTA dapat mengamalkan satu sistem pengurusan kualiti yang universal dengan izin, dan berlandaskan kepada standard yang diiktiraf di peringkat antarabangsa. Perkhidmatan awam Malaysia digalakkan mencapai taraf MS ISO 9000 bagi memantapkan lagi bagi sistem pengurusan kualiti yang sedia ada. Dalam hubungan ini pelaksanaan standard MS ISO 9000 di IPTA tidak akan menyekat kreativiti dan kebebasan ahli akademik dalam menjalankan tugas mereka bahkan dapat berfungsi sebagai blue print dengan izin untuk menambah baik dan meningkatkan sistem kualiti dan kecekapan serta keberkesanan tugas para pensyarah. Pelaksanaan standard MS ISO 9000 di IPTA telah dapat membantu meningkatkan lagi keupayaan pihak pengurusan IPTA membuat keputusan dengan lebih tepat, mewujudkan cara bekerja yang konsisten dan menepati prinsip betul pertama kali dan setiap kali yang secara langsung dapat mengawal kos kualiti bagi kerja-kerja yang berulang dan mengelakkan pembaziran serta meningkatkan produktiviti. Standard MS ISO 9000 telah diguna pakai oleh 157 buah negara. Kementerian memberi jaminan bahawa pelaksanaan Standard MS ISO 9000 sama sekali tidak akan menjejaskan kreativiti dan kebebasan ahli akademik IPTA, sebaliknya mampu meningkatkan lagi kualiti urus tadbir IPT tempatan agar setanding dengan IPT lain di persada antarabangsa. Dato' Markiman bin Kobiran [Hulu Langat]: Terima kasih, Tuan Yang di-Pertua. Terima kasih, Yang Berhormat Timbalan Menteri. Kita sedar keperluan penarafan MS ISO 9000 yang dinyatakan begitu banyak kebaikannya. Soalan tambahan saya, adakah pihak kementerian sudah memberi persiapan yang cukup kepada para academician bagi mematuhi beberapa standard serta prosedur yang mereka patuhi. Soalan kedua yang juga agak ringkas ialah dalam kaedah mengukur keberkesanan atau kecekapan atau proses ulangan yang dilaksanakan oleh para pengajar atau para pensyarah ini adalah sukar untuk mengukur secara ringkas atau secara tepat kerana terlalu banyak faktor lain dan mengambil kira bidang profesionalisme mereka juga kerana sebagai pendidik mereka mempunyai bidang-bidang yang berbeza. Kayu ukur yang sama tidak boleh digunakan kepada pengajar kejuruteraan dengan pengajar-pengajar di bidang ekonomi dan sebagainya. Bagaimanakah kementerian melihat kaedah ini supaya dapat diseragamkan, dengan adanya perkataan standardization yang boleh diguna pakai dalam mengukur kecekapan mereka. Terima kasih, Tuan Yang di-Pertua. Datuk Ong Tee Keat: Terima kasih, Tuan Yang di-Pertua. Saya mengucapkan terima kasih kepada Yang Berhormat bagi Hulu Langat di atas keprihatinan beliau terhadap kualiti IPT kita. Sukacita saya memaklumkan Yang Berhormat bahawa sesungguhnya pelaksanaan piawaian ISO ini bukanlah secara paksa dan bukanlah diseragamkan oleh kementerian saya. Sebaliknya ia adalah terserah kepada IPTA masing-masing. Ini kerana ia mengenai IPTA yang dibangkitkan tadi jadi saya jawab mengenai IPTA. Ia tidak merangkumi sebarang sukatan ataupun kaedah penyukatan terhadap urusan akademik tetapi sebaliknya ia lebih menjurus ke arah piawaian khas untuk urusan kewangan, urus tadbir kewangan, pendaftaran dan juga sumber manusia. Ia bukannya secara khusus seperti mana yang disarankan oleh Yang Berhormat diimposed, dengan izin ataupun ia bukanlah dikhususkan untuk menyekat ataupun mengawal selia kualiti sesuatu program pengajian, khasnya dalam sesuatu jurusan pengajian yang khusus. Tuan Lim Kit Siang [Ipoh Timor]: Apakah guna piawaian ISO 9000 apabila mutu universiti-universiti - IPTA semakin merosot yang dilihat daripada ranking terkini, Times Higher Education Supplement di mana semua universiti terkeluar daripada senarai 200 hingga sekarang kita tengok, kita tidak tahu apa universiti yang boleh kata the premier university. Who is the best universiti yang ada di Malaysia. Adakah Universiti Malaya, tidak tahu? Sudah jatuh dan kalah kepada UKM tahun lalu dan tidak diiktiraf sebagai five stars university di dalam satu petunjuk yang dibuat oleh kerajaan sendiri. Adakah UKM sudah jatuh dalam tahun ini? Adakah Universiti Sains Malaysia di tangga ke-307 dan kenapa ini semua berlaku. Bukankah apa yang lebih mustahak ialah mengadakan emphasis mengenai bagaimana boleh memulihkan keunggulan, excellent meritokrasi universiti-universiti kita. Bukan semacam apa yang berlaku ISO 9000, UUCA semacam Universiti Putra Malaysia sekarang di mana mahasiswa Lee Sung Young dianiayai. Apabila Universiti Putra Malaysia sudah jatuh 52 tangga tahun lalu, 292 kepada tahun ini 364, bukankah emphasis semua sudah silap. Menteri Pengajian Tinggi pergi ke China menjadi salesmen untuk mendapatkan lebih pelajar-pelajar China datang ke Malaysia. Yang mustahak sekarang ialah bagaimana boleh memastikan adakah universiti-universiti Malaysia boleh dilihat dan diiktiraf sebagai antara 200 universiti yang terbaik di dunia. Datuk Ong Tee Keat: Tuan Yang di-Pertua, saya sungguh terperanjat dengan apa yang telah dibangkitkan oleh Yang Berhormat Ipoh Timor khasnya beliau merupakan seorang Ahli Parlimen yang begitu berpengalaman luas dan lama. Kita sedia maklum bahawa piawaian ISO itu seperti mana yang telah saya sebutkan tadi ia adalah lebih tertumpu kepada piawaian urus tadbir dan bukannya untuk menyukat prestasi ataupun keberkesanan sesuatu program akademik sepertimana Yang Berhormat sendiri hubung kaitkan. Datuk Ong Tee Keat: Yang saya hendak jawab ini, saya kena jawab secara lantang untuk menangkis apa yang diputarbelitkan oleh Yang Berhormat. Yang dicakapkan itu walau pun benar ranking itu jatuh merosot, itu benar. Kita tidak nafi. Tidak ada denial syndrome dengan izin tetapi jangan cuba mengaburi mata masyarakat. Hindraf rally roadblocks – Would it be better to release the police to prevent crime? I found it totally ridiculous for police to set up numerous roadblocks across Selangor on roads leading to Kuala Lumpur, causing major traffic jams since yesterday morning bringing the rush-hour traffic to a crawl. It is reported that the roadblocks are set-up to prevent criminal activities. However it was widely believed that the roadblocks are to slow down the traffic in order to prevent people from attending a massive public rally organized by Hindus Rights Action Force (Hindraf) on Sunday morning in front of the British High Commission to present a petition to Her Majesty Queen Elizabeth to support a class-action suit against Her Majesty's government for bringing Indians to Malaysia as indentured labourers and exploiting them for 150 years. Such roadblocks are totally unnecessary as the said public rally is to take place on Sunday morning and the roadblocks have cause massive and unnecessary inconveniences to motorists. Right to peaceful gathering is a fundamental human rights enshrined under the Federal Constitution. So long so public order is maintained, no party including the police should bar people from attending any peaceful gathering. It is even more ridiculous for the police to try to ‘lock’ traffic flow in the Klang Valley as it is not to the benefit of the country’s economy and productivity. Today is another working day and some could be working tomorrow. Such roadblocks should be removed at once, especially when some of these roadblocks are not properly manned by police personnel. Or the police not have any other better things to do until they have to waste taxpayers’ monies for such unnecessary roadblocks which serve no improvement to crime prevention? Would it be not better if the police can fully utilize these personnel and release them for genuine crime prevention duties? Three Hindu Rights Action Force (Hindraf) leaders who were to be charged with sedition at the Klang Sessions Court this afternoon, managed to walk free on technical grounds. The trio, who were not charged today, were granted bail set at RM800 per person by judge Zumaidah Mohd Idris. However, Hindraf chairperson and lawyer P Waythamoorty refused to post bail as a mark of protest against the ‘police being used by the government’. He will be detained by the police until Monday and had vowed to go on a hunger strike. He was reportedly sent to Sungai Buloh prison. However, his brother and Hindraf legal adviser Uthayakumar and another Hindraf lawyer, Ganapathy Rao, posted bail. Nevertheless, all three will be back in court on Monday to be formally charged. Some 2,000 supporters, who were cheering throughout the proceeding, mobbed the duo as they walked out of the court building at about 6.45pm. The trio were represented by lawyer M. Manoharan, A. Sivanesan, K. Ramu, VS Ganapathy Rao and R Kengadharan. All of them are also DAP members except Kengadharan. Among those who attended the procedding including Parliamentary Opposition Leader Lim Kit Siang, DAP CEC leader Ronnie Liu, DAP Selangor Secretary Lau Weng San, DAP Selangor State Committee Member T. Kannan and DAP Selangor Vice Chairman Peter Tan. 'Mari lawan!' - Sothinathan challenged Po Kuan to a "fight"
I guess this MIC MP is so used to the way they handled political disputes in MIC that they can be so bold to come out with a challenge for a fist fight outside the chamber with Po Kuan, a woman MP. DAP MP for Cheras, YB Tan Kok Wai spoke in a dinner held by DAP Bukit Bintang yesterday night in Pudu. Among the issues he raise was the assault by UMNO members on a Guang Ming Daily photographer about a week ago when the photographer was on duty to cover Tan Kok Wai's press conference in highlighting power abuse by UMNO Cheras. UMNO Cheras was alleged erecting their divisional office on a piece of land reserved for public hall (which is a government property). This is Tan Kok Wai's speech in Cantonese. 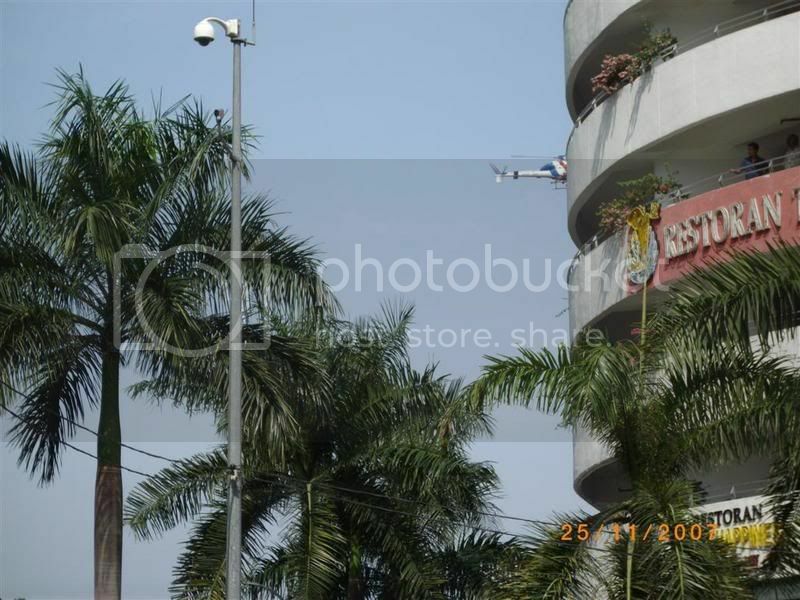 The video was first shown during a fund-raising dinner in PJ on 20th November 2007. He urges to voters of Petaling Jaya to vote for changes in the coming Malaysia General Election. A change is to make PJ and Malaysia in general a better place. The video clip is produced using Michael Jackson's "Man In The Mirror". Recent street protests have highlighted the self-serving nature of Malaysia's Government. THE Government of Australia will probably change hands this weekend. There will be no arrests, no tear gas and no water cannons. The Government of John Howard will leave office, the Opposition will form a government and everyone will accept the verdict. For this, every Australian can feel justifiably proud. This playing by the rules is what has made Australia rich and a good place in which to invest. It is a country to which people want to migrate; not leave. Now consider Malaysia. The weekend before last, up to 40,000 Malaysians took to the streets in Kuala Lumpur to protest peacefully against the judiciary's lack of independence, electoral fraud, corruption and a controlled media. In response, they were threatened by the Prime Minister, called monkeys by his powerful son-in-law, and blasted with water cannons and tear gas. And yet the vast majority of Malaysians do not want a change of government. All they want is for their government to govern better. Both Malaysia and Australia have a rule of law that's based on the English system. Both started out as colonies of Britain. So why is Malaysia getting it so wrong now? Malaysia's Government hates feedback. Dissent is regarded as dangerous, rather than a product of diversity. And like the wicked witch so ugly that she can't stand mirrors, the Government of Prime Minister Abdullah Badawi controls the media so that it doesn't have to see its own reflection. Demonstrations are typically banned. But what every Malaysian should know is that in Britain, Australia and other modern countries, when people wish to demonstrate, the police typically clear the way and make sure no one gets hurt. The streets belong to the people. And the police, like the politicians, are their servants. It is not the other way around. But increasingly in Malaysia, Malaysians are being denied a voice — especially young people. Section 15 of Malaysia's Universities and University Colleges Act states that no student shall be a member of or in any manner associate with any society, political party, trade union or any other organisation, body or group of people whatsoever, be it in or outside Malaysia, unless it is approved in advance and in writing by the vice-chancellor. Nor can any student express or do anything that may be construed as expressing support, sympathy or opposition to any political party or union. Breaking this law can lead to a fine, a jail term or both. The judiciary as a source of independent viewpoints has been squashed. The previous prime minister, Mahathir Mohamad, did many good things for Malaysia, but his firing of the Lord President (chief justice) and two other Supreme Court judges in 1988 was an unmitigated disaster. Since then, what passes for a judiciary in Malaysia has been an utter disgrace and the Government knows it. Several years ago, Daim Zainuddin, the country's then powerful finance minister, told me that judges in Malaysia were idiots. Of course we want them to be biased, he told me, but not that biased. Rarely do government ministers need to telephone a judge and demand this or that verdict because the judges are so in tune with the Government's desires that they automatically do the Government's beckoning. Just how appalling Malaysia's judiciary has become was made clear in recent weeks with the circulation of a video clip showing a senior lawyer assuring someone by telephone that he will lobby the Government to have him made Lord President of the Supreme Court because he had been loyal to the Government. That someone is believed to have been Ahmad Fairuz Abdul Halim, who did in fact become Lord President. A protest march organised by the Malaysian Bar Council was staged in response to this, and corruption among the judiciary in general. But the mainstream Malaysian media barely covered the march even though up to 2000 Bar Council members were taking part. Reportedly, the Prime Minister's office instructed editors to play down the event. Instead of a free media, independent judges and open public debate, Malaysians are given stunts — the world's tallest building and most recently, a Malaysian cosmonaut. Essentially, they are given the play things of modernity but not modernity itself. Many senior Malays are absolutely despairing at the direction of their country today. But with the media tightly controlled they have no way of getting their views out to their fellow countrymen. This means that most Malaysians falsely assume that the Malay elite is unified when it comes to the country's direction. Tengku Razaleigh Hamzah, a former finance minister and today still a member of the Government, told me several weeks ago in Kuala Lumpur that he could see no reason why today Malaysia could not have a completely free media, a completely independent judiciary and that corrupt ministers and other officials should be publicly exposed and humiliated. According to Tengku Razaleigh, all of the institutions designed to make Malaysia's Government accountable and honest have been dismantled or neutered. It didn't need to be like this. Malaysia is not North Korea or Indonesia. It is something quite different. Its legal system is based on British codes. Coupled with traditional Malay culture, which is one of the world's most hospitable, decent and gentle cultures, Malaysia has the cultural and historical underpinnings to become one of Asia's most civilised, rules-based, successful societies. Instead, Malaysia's Government is incrementally wasting Malaysia's inheritance. We also received a mailed-complaint that the tender offered by a bumiputera company to supply, install, test, commission and configure IT equipment (Total Hospital Information System Phase 2) for Selayang Hospital was cancelled by the Selangor State Health Department as the Division of Procurement and Privatisation of the Ministry of Health had in a letter directed to the Selangor State Health Department informed that another company named Systematic Conglomerate Sdn. Bhd. had appealed to the Ministry and was granted the contract to provide operation and back-up service as well as to upgrade the equipment, software and maintenance of Selayang Hospital Total Hospital Information System (THIS) for 3 years with the option of another 3-year extension with effective from 1st September 2007. From the complaint we received, the tender was called by the Selangor State Health Department and several bumiputera contractors offered their tenders. It was later intervened by the Ministry of Health and the whole tender process was suspended and the Selangor State Health Department issued letter to all bidder to cancel the tender. It was unfair for the bidders as they have already submitted their quotation with the hope of securing the project when the tender was cancelled when another competitor stepped-in and appealed to be granted the project. Such happening reflects very poor on the transparency and integrity of the government. It is even more shocking that a photograph was also provided that features the Executive Chairman Dato' Amanullah Mohamed Yusoof and Managing Director Haji Wan Azhar Ali of Systematic Conglomerate Sdn. Bhd. presenting a mock cheque of RM50,000 to MCA Johor on 10th April 2007. We will write in to the Auditor-General to request him to carry out a proper audit on the whole tender process in supplying, installing, testing, commissioning and configuring IT equipment (Total Hospital Information System Phase 2) for Selayang Hospital. We will also consider lodging a report with ACA but for the first step, Health Minister should come clear to explain all this. Typical understanding of a Bumiputera status company is that 51% or more of the shareholders of the company must be bumiputeras but we have received a mailed complaint to show that the definition of a Bumiputera company has gone deeper that such company must also employ more than 51% bumiputera as employee. This is double-discriminative policy as bumiputera companies should be given the free hand to operate including in handling their employment preferences based on meritocracy. If the government is serious about its slogan of “Cemerlang, Gemilang, Terbilang” to create a world-class economic system to transform Malaysia into a knowledge-based innovative economy, it must end the NEP-mentality in our economy and fully restore the policy of meritocracy and performance excellence coupled with social need to provide employment opportunities to economically-backward Malaysians regardless of race. In Budget 2008, the Government had announced that beginning financial year 2008, PLCs will be required to disclose their employment composition by race and gender, as well as programmes undertaken to develop domestic and Bumiputera vendors. The private sector should leverage upon the strength of Malaysia’s diversity by employing Malaysians from all ethnic groups. Why this has not been done by the government in public services and GLCs? And what moral authority does the government has in requiring PLCs to disclose their employment composition by race in year 2008 when government agencies and GLCs are not compelled to do it? All companies, be it bumiputera companies or not, should be allowed to employ the most qualified and most competent Malaysians with competitive remunerations and restore a culture of excellence and meritocracy. One simple test of whether the government is seriously committed to abandon the baggages of past NEP policies to create a world-class university system is whether it has the political will to end the brain drain depriving Malaysia of the best and brightest for the development of the country. Tindakan Menteri Besar Selangor Khir Toyo memberi anugerah penyapu kepada agensi-agensi dan badan-badan kerajaan negeri Selangor tidak akan menyelesaikan masalah pentadbiran baik yang melanda negeri Selangor kerana masalah-masalah yang tertimbul berpunca daripada kelemahan-kelemahan dari segi struktur dalam pentadbiran kerajaan negeri dan ianya tidak akan diselesaikan melainkan masalah-masalah struktur ini diselesaikan. Antara dua buah agensi kerajaan negeri Selangor yang dianugerahkan anugerah penyapu ialah Majlis Daerah Ulu Selangor dan Pejabat Tanah dan Galian Daerah Ulu Selangor. Sebenarnya, berita tentang anugerah penyapu untuk mana-mana agensi atau badan kerajaan Selangor yang lemah telah dilaporkan di media aliran utama setahun yang lalu. Biarpun begitu, kami beranggapan ianya tidak berkesan dalam menambahbaik prestasi dan kualiti kerja kerajaan negeri Selangor kerana Menteri Besar sendiri tidak melaksanakan pembaharuan besar-besaran dari segi struktur. Rakyat Selangor tidak boleh berharap bahawa pembaharuan dan penambahbaikan yang berlaku tanpa pembaharuan dari segi struktur. Salah satu factor yang kritikal ialah pilihanraya Pihak Berkuasa Tempatan (PBT). Bak pepatah “Rakyat hakim negara”, “Tiada percukaian tanpa perwakilan”. Maka makna pepatah ini sesuai dipakai untuk PBT dimana rakyat harus diberi hak untuk memilih anggota-anggota majlis apabila mereka ini turut merupakan pembayar cukai kepada PBT. Jikalau MB betul-betul ingin mempertingkatkan prestasi dan kualiti kerja agensi dan badan-badan kerajaan Selangor, apa yang beliau perlu ialah political will atau hasrat politik dan bukannya penyapu. On Tuesday, Malaysians saw on CNN the spectacle of the implosion of the 16-storey 1,000-room New Frontier casino-hotel, collapsing the second resort that opened on the Las Vegas Strip half-a-century ago with 1,000 pounds of explosives. It was a spectacular engineering feat to behold, the precisely-planned and delicately-balanced demolition operation -- to give way to a US$2 billion, 3,000-room megaresort Las Vegas Plaza, featuring a 500-ft tall Ferris Wheel similar in size to the famous London Eye, set to open in 2011. Malaysia has also our own implosion on the same day, but it was a most shameful and ignominous one - the collapse of the RM4.5 million Perak State Park Corporation's two-storey administration building on a hillslope on the edge of Tasik Banding in Gerik. Star said the structure "collapsed like a house of cards" while New Straits Times said the complex "collapsed into a heap of rubble". Malaysia's very own implosion was no spectacular engineering feat but spectacular building failure and government negligence. After the Perak "implosion", three different probes have been set up to investigate it causes --an "independent" committee by the state government, another investigation by the Perak Public Works Department on the directive of Works Minister, Datuk Seri S. Samy Vellu and by the Anti-Corruption Agency. Heads must roll, and roll immediately, for the shameful "implosion" of the Tasik Banding complex -- or are there no one to be held responsible? Malaysia's implosion -- which is so different from the Las Vegas implosion -- is evidence that Malaysia is even more entrenched as a Third World country instead of joining the ranks of the First World nations. Lim Kit Siang bertikam lidah dengan seorang lagi Timbalan Menteri di Kementerian Penerangan Chia Kwang Chye berkenaan dengan peranan RTM dalam menyiarkan laporan beritanya yang selalunya dituduh sebagai berat sebelah dan tidak seimbang. Kit Siang, dalam soalan tambahannya semasa sesi soal jawab semasa Kementerian Penwrangan menjawab soalan yang ditanya oleh Ahli Parlimen Rembau, antara lain mengatakan bahawa RTM harus melaporkan kebenaran dan seimbang dalam laporannya kerana RTM biarpun merupakan stesyen milik kerajaan perlu seimbang dlaam laporannya kerana ianya ditabung oleh wang para pembayar cukai seluruh Malaysia. "RTM bukan stesyen BN. Ianya bukan RTBN, tetapi RTM - Radio Televisyen Malaysia". Lim Kit Siang speaks on the latest deplorable ranking of Malaysia public universities in international ranking. Unfair reporting by RTM1 Parlimen Hari Ini. RTM did not put up the full debate in it's Parlimen Hari Ini programme on Tuesday night. Although the newscaster mentioned that YB Lim Kit Siang was involved in another exchange of words with Zahid Hamidi as Deputy Information Minister concerning the massive peaceful public rally last Saturday, Kit Siang's speech was completely blacked-out. What YB Lim Kit Siang as Parliamentary Opposition Leader said during the heated exchange was also completely blacked-out when RTM only aired part of Zahid Hamidi's reply during question time. Kit Siang among other claimed that Minister of Information, Zainuddin Maidin as Minister of Mis-Information for his arrogant and shameful reply in answering question posed to him by Al-Jazeera on Bersih's gathering. If Zam is talking about putting up Kit Siang's blog in RTM website, why can't him honour his own words by putting full content of what opposition MPs said in the Parliament? The PM and his super cronies after 50 years, had failed to realise that the question that to “drag the King into politics does not arise”. When the King our Supreme Sovereign Head does not get himself in daily politics or a member of the executive, it does not mean that his Majesty is totally above politics and is just a fiqure head of the country. In a democratic country with a constitutional monarchy like Malaysia, we have the Monarchy, Executive, Judiciary and Legislature. Each is independent of the other. If everything runs smoothly, the Royalty stays at his Palace, and is happy that his subjects are happy. The economy turns, majority of his Royal subjects has a job and development is in full swing. The job of the King is to oversee that the country is running in proper order. His Majesty has the constitutional right to intervene today because everything is wrong today. The King is the people’s TRUSTEE. The Trustee has to act constitutionally today before the country go to the rocks! His Majesty need not take sides. The Royalty must see that there is fair play. The King is there to PROTECT the Constitution from being abused. He is the CUSTODIAN of the Constitution. Please don’t insult the King! The level of the playing field is tilted in favour of the powers that be. They even shift the position of the goalpost to whatever position they like! Everything is wrong today! One cannot even be safe inside our house. 300,000 graduates are jobless, Parliament leaks, a former railway gatekeeper’s house is bigger than a Division One Officer, the police is divided, Team A accusing Team B, we a net exporter of gas and petroleum yet we have to pay more for gas and petroleum instead of paying less when the prices rises, the top cronies are enjoying themselves as patrons of Petronas Philhamonic Orchestra, patients suffering unnecessarily instead of getting cured by the hospitals, everywhere you walk you see foreigners as much as you see your fellow citizens, government purchases having a free for all, no tenders being called as cronies lined up to secure projects at exorbitant prices, a 4.6 billion free trade zone as a white elephant collecting dusts, a congested bus terminal built 33 years ago and its next door – a dilapidated half constructed building, breeding anopheles and aedes mosquitoes, prices of houses and cars beyond the reach of the mid income family, electricity prices increase by Tenaga although they make billions, buying screwdrivers at exorbitant prices, banks of a certain race taken over by another bunch of cronies in the pretence of having less banks but bigger banks to compete overseas, companies are asked to employ their staff in relation to the country’s population ratio but their own GLCs, universities full of their cronies such that they reflect the superpower of the cronies and pages and pages to be filled—-endless. The King must step in to stop the rot! Enough is enough. 50 years of mismanagement is sufficient! The most important underhand tactic is the Election Commission reporting to the BN. Overnight they increase the Ipoh Timor Constituency by 8500 voters and then claim that it is their absolute right! Before the election you will already know who the winner MP is. Bukit Bintang has no army camp but got postal voters by the army. Therefore the Election Commission must report to an independent body and NOT to the BN! The Election Commission keeps the BN in perpetual power! The march by BERSIH is NOT a demonstration. During Prophet Mohamed Birthday the Muslims march. During Wesak the Buddhists march. During Deepavali the Indians march. During Saint Anne Festival the Christians march. All religions and groupings march. So why can’t BERSIH march? The powers that be, make it illegal. Gambling is illegal. But gambling at the Genting Highlands is LEGAL. Buying 4 digits is illegal. But buying 4 digit from Magnum, 3D and Toto is LEGAL. We want to tell AAB that we are not born yesterday! The shops at Masjid Jamek and Jalan Tuanku Abdul Rahman were doing a roaring business. Without provocation water cannons and teargas were fired. Hell broke loose. The shops have to close. So who is to blame? Buses were turned back at the highways. The commuter trains stop running. Road blocks were set up. The police were not looking for weapons. They were looking for YELLOW shirts! What is wrong with yellow shirts? Are yellow shirts weapons? Why don’t the police stop the Buddhist monks from wearing YELLOW. SO WHO’S THE CULPRITS OF THE TRAFFIC JAMS? It is a deliberate attempt by the police to stop the march! 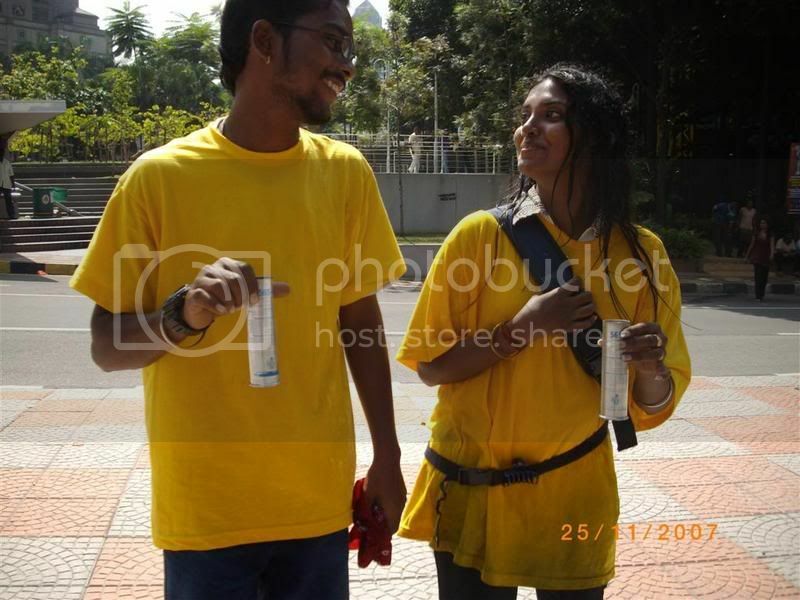 BERSIH has declared that yellow is the colour of protest; it’s also the colour of press freedom. Wearing yellow also shows our love for the Rulers. The police has insulted the Royalties. What is wrong if the people want to hand his Majesty a memorandum? You mean we have to send by the unreliable post office? It is just a memorandum on the demand for a clean and fair electoral system! What is the big fuss? p/s ; any difference between detained and arrested?!?.. Kit Siang told Zam to publish all!